Does this powerful all-in-one video editing package meet your needs? It may be rough around the edges in some places, but DaVinci Resolve is a serious contender in the video editing sphere, offering a polished interface with tons of possibilities. When you think of video editing, you’ll often picture the big boys like Premiere, Avid, maybe even Final Cut Pro, but there are other apps you should definitely take a look at, some may even give those big boys a serious run for their money. One such app is DaVinci Resolve. Since BlackMagic acquired the software, they’ve made some serious modifications to it, to the point that it can now be considered a strong contender for video editing, colour grading, special effects and sound mixing, for an extremely affordable price. And best of all, it works on your platform of choice, be it Mac, Windows or Linux. BlackMagic offer a free version, which caters for most needs of a budding (and not so budding) editor. There are a few functions missing, but you can’t beat that price for a very stable and powerful tool. Studio, the paid version, offers more effects and templates, and among others, the ability to edit in 4K and up to 120fps, in addition to more under the hood performance improvements. 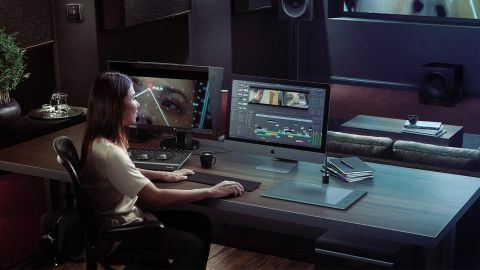 Unlike Adobe, who expect you to fork out for a monthly subscription to use their wares, DaVinci Resolve Studio is yours for a one-off fee, just like Final Cut Pro. You pay $305 (£239) for a licence and all future upgrades, including the major ones, are free. So what do you get for your money? The latest version of Resolve (15.2) is far more than an editing app. The interface itself is divided into six sections: Media, where you import and manage the clips you need; Edit, where you build your project; Fusion, a powerful 2D and 3D video effects compositor; Color, impressive colour grading tools; Fairlight, highly precise audio manipulation; and finally, Deliver, where you export your project, ready to share it with the world. We’ll be taking a brief look at each of them in turn. Importing media is very simple: Resolve grants you direct access to any drive connected to your computer. Hook up a camera, and its files will be available too, although you should drag your files to a hard drive first because Resolve merely links to external media and does not make a copy of it for your project. The basic editing interface is very comprehensive. It’s divided into sections with your libraries top left, your preview and viewer windows to the right, and your timeline and index at the bottom. Depending on your needs, all of this can change: invoke the Inspector and it’ll appear top right. Don’t need the Index? Just get rid of it. Even the timeline can be customised to satisfy your preference: you can change the size of the video layers, choose how many thumbnails will be shown per clips, whether or not you want to see audio waveforms, etc. But the meat and potatoes of this section is how easy is it to cut a video. And the short answer is, very easy. If you’re used to editing on other software, you’ll feel right at home in DaVinci Resolve. Keyboard shortcuts are familiar (but those can be fully customisable if you aren’t happy with them), and you can navigate your edit easily via the keyboard, mouse, or any other suitable hardware you’ve got connected to your computer. One feature we particularly liked was being able to alter multiple clips at once: select several audio clips for instance and change all of their volumes in one go with a slider in the Inspector. This is a great time saver. If you want to get creative, this is where Fusion comes in. Think of it as AfterEffects or Motion, but fully built into your video editing app. No need to launch other software. There is a pretty major difference to those other two apps though: Fusion is not layer based, but node based. This way of working is incredibly powerful but does take a little while to get used to. Buttons on top of the effect building area lists the most common nodes (like text, blur, transform and 3D), but there’s also an effects library filled with other tools you can add to the composite you’re creating. You can create animations as you’d expect, with the use of keyframes: set one for a particular value, move the playhead to another location, change the parameter, and you’re done. Colour grading is also based on nodes, but this section can highlight a great advantage of this method: creating a shared node allows you to set a specific colour grade you can apply to multiple clips. Should you then alter that node, all clips linked to it will take on those new properties instantly. This section also comes with numerous LUTs (Look Up Tables). Mouse over one to see a direct preview of what your clip will look like with it applied (this preview feature is great and should really be implemented throughout the editing process). Fairlight is where you manipulate your audio, and the tools you have at your disposal there are impressive. Once again, you have a good selection of effects which you can then customise to your needs. Finally, you have Deliver, where you choose the format you’d like to export your project as. There are some default presets like YouTube, Vimeo or ProRes. It’s just a question of selecting one and saving it to your computer. There is no option to directly send your finished product to media sharing sites. This has been a bit of a whistle stop tour of DaVinci Resolve, simply because there is so much to cover. There are still some places where the software feels a little rough around the edges, but for the most part, the experience is incredibly positive. If you’re serious about video editing, you should definitely check what this software has to offer. You really have nothing to lose since the download is totally free. It’s only if you want the additional features of the Studio version that the relatively small one-off fee comes into play.